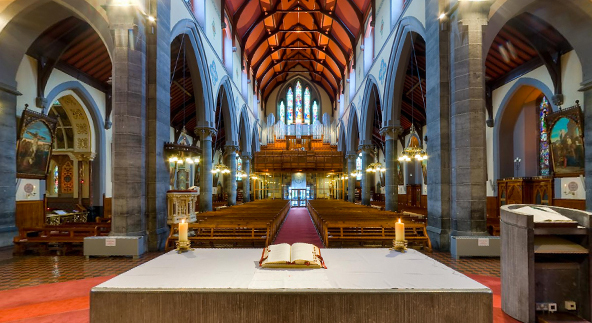 Sunday Mass Times: Vigil on Saturday at 7.15pm, then at 8am, 12 Noon & 7.15pm on Sunday. Cantors will lead congregational singing at the Saturday Vigil & 7.15pm Sunday Masses. There is both cantor led and choir singing at the 12 Noon Sunday Mass and a special childrens liturgy at the 12 Noon Sunday Mass also. Monday to Friday: Masses at 8am (except bank holidays), 10am & 7.15pm. There is also the Holy Family Men’s Confraternity as part of the 7.15pm Mass every Monday night, except during August. The St. Gerard Majella Novena takes place at the 10am & 7.15pm Masses every Wednesday. Saturday: Masses at 10am & 7.15pm (Vigil for Sunday). Both these Masses have cantor led singing. The Mother of Perpetual Help Perpetual Novena is celebrated at both Saturday Masses. Confessions: Confessions are heard in the church before from 9.30am to 10am, and from 6.45pm to & 7.15pm, every Wednesday and Saturday. Also from 3pm to 4pm on Saturday afternoons. A priest is also available in the monastery parlour, for confession or a chat, from 11am to 12.30pm & from 3pm to 5pm, Monday to Friday (except bank holidays). The Monastery Office / Reception / Shop is open, Monday to Saturday, from 9am to 8pm (except bank holidays and Good Friday, and from 11.30 to 8pm on Sunday.